Max Original Feed Up to 11" x 17"
LCC - 16 lb. bond to 100 bristol. 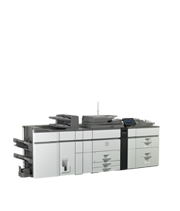 Supported paper types include thin, plain, recycled, color, letter head, pre-printed and pre-punched, embossed and glossy. Network OS Windows Server 2003-2008, Windows XP, Windows Vista, Windows 7, MAC OS 9-9.2.2, MAC OSX 10.2.8, 10.3.9, 10.4.11, 10.5-10.5.8, 10.6-10.6.5, Novell Netware 3x, 4x, 5x, Sun OS 4.1x, Solaris 2x, Unix, Linux and Citrix (Metaframe, Presentation Server 4, 4.5) and Windows Terminal Services. TCP/IP (IPv4, IPv6, IPSEC) SSL (HTTP, IPP, FTP), SNMPv3, SMTP, POP3, LDAP, 802.1x for Windows and Unix. LPD and LPR for Unix. IPX/SPX for Novell environments and EtherTalk.